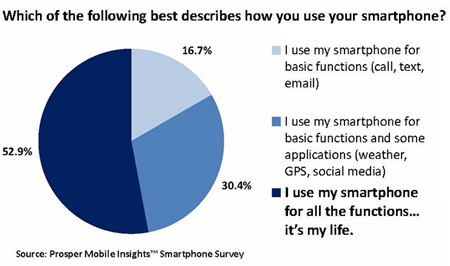 Another 30.4% of surveyed smartphone owners say they use the basic functions of their device plus a few apps, whereas 16.7% use their smartphone just for calling, text messaging, and email. Below, additional findings from a report by Prosper Mobile Insights, based on a survey of 102 smartphone users who completed the survey via smartphone. Asked which device function they can’t live without, most smartphone owners cite texting (21.6%), accessing the Internet (16.7%), or sending/receiving email (15.7%). Fewer users can’t live without calling features (7.8%), GPS (6.9%), access to Facebook (5.9%), or apps (4.9%).